The bi-monthly health network news delivered to your inbox on the 1st and 3rd Tuesday of the Month. The deadline to make your hotel reservations will have arrived and passed when the next newsletter comes out in 2 weeks. Here is your final reminder: Make Hotel Reservations by March 25, 2013! The NCHN Conference is less than a month away. Make sure you register before April 1st to get $75 off of on registration. What’s Driving Your Nonprofit: Opinion or Expertise? There Is a Difference! You either like or dislike Picasso’s work. That’s your personal view or attitude. But art experts judge Picasso as a seminal artist, a game-changer. You hire a lawyer and pay attention to what she says without wasting too much time offering your ill-informed or uninformed opinions about the law. You hire a doctor and don’t second-guess her surgical methods. This week, we interviewed NCHN's President, Heather Fuller, Executive Director of the 2011 NCHN Network of the Year, Sunflower Health Network. We asked some questions about her membership with NCHN and experience on the Board, as well as what has made SHN so successful. Heather has been a member of NCHN for over 7 years and has served as President since April 2012. Monthly Recap: From Rebecca Davis, Ph.D.
Oh my, did you realize there are only 29 days until we meet in New Orleans for the 2013 NCHN Annual Educational Conference, All that Jazz! If you haven’t registered already and secured your room, I recommend you hop to it! Thanks to Christy, details are provided elsewhere in the eNews or you can access directly at the NCHN website. Also, if you have not taken a look at the 2013 Conference webpage, please take a minute to do so. It includes lots of information to assist you in preparing for your journey to New Orleans, along with a listing of our Conference Sponsors, exhibitors, and advertisers. These companies and individuals help make the annual event possible. 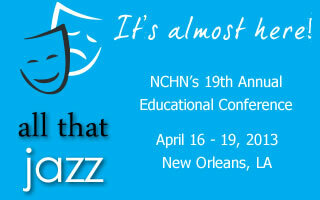 NCHN is pleased to announce a scholarship to assist with lodging at the 2013 NCHN Annual Educational Conference – All that Jazz! The conference will be held April 16-19, 2013 in New Orleans at the Omni Royal Orleans Hotel. Thanks to the generosity of the hotel, a first-time conference attendee will receive a certificate for two nights lodging and dinner to be used during the conference. The winner will be announced on Tuesday, April 2. In order to be considered, you must be the network leader, never attended a NCHN conference before, and be registered to attend the 2013 conference by March 29, 2013. If selected for the scholarship and you are not a current NCHN member, in addition to the lodging scholarship, the conference registration fee will be revised to the membership rate for an additional savings of $100. For a number of years, the Tennessee Primary Care Association (TPCA) was the recipient of a federally funded SEARCH grant (student/resident experiences and rotations in community health) to support rural/underserved rotations for health professions students and medical residents. The SEARCH program was terminated in September 2012. However, due to the successes of the administration of the SEARCH program by TCPA and the Tennessee Rural Partnership’s (TRP) rural rotation program, a consensus was reached by the leadership of these groups that a joint program would be developed to focus on the most efficient and useful strategies and resources of each organization and their partners. RWHC: Eye on Health (April 2013): "Spring Will Follow a Lousy Winter"
Health care providers are permitted to apply to receive reduced rates for a variety of telecommunications services under the Rural Health Care Program.